Rick is still successfully employed transporting our furry friends to the next dimension. He’s very good at his job and in high demand. Just the other day, Rick was called to remove a sleeping soot-encrusted possum that had free fallen from the roof down the flue of a Kent fireplace. A “Kent” is a New Zealand woodburner and the flues are normally very long and thin – so he must have been a very skinny critter! Trouble was the little rascal woke up and started decorating the Kent glass door with an etching pattern that could hardly be deemed a work of art, so the offender was quickly sent to meet his maker. We take solace in the fact that the Kent was not used as an indoor crematorium. The deceased is grateful he has escaped the eternal damnation of the fires of hell. The home owners are grateful that the chimney sweep does not now have to come in for another year. May our furry friend’s soul rest in peace. He probably had a very good life, and it’s nice to know that a part of him lives on in Aunty Ruby’s organic vegetable garden. As relayed by Rick, not realising that Ms Possum would embellish, hyperbolise and immortalise all his possum adventures. May he never read her blog! Rick has just informed us here at Possum New Zealand that the “deposits” in Aunt Rubys backyard are now in the vicinity of 110, but hey, who’s counting? Also, Aunt Ruby’s cabbages he tends particularly thrive on this highly patentable fertilizer. Rick’s success in capturing possums is now due to the wonder drug – Cinnamon! Sprinkle this up to the entrance of the cage, and whammo, Bob’s your Uncle. Do try this recipe and let us know your success rate. Mind you, I have to say that the actual translation for “possum” from Chinese to English is “Apple Eating Tree Bear.” How cute! However as you will all know by now, our possums are not bears, but actually marsupials – animals with pouches that we inherited from our Aussie cousins about 150 years ago. The good news is that we are gradually sending some back in value-added form to our transtasman rivals – a bit like selling ice to the Eskimos, hehe! Ms Possum was invited back again to her friends place in the Central Eastern Auckland suburbs for another round of possum spotting. Ms Possum was surprised at this follow-up invitation as she had remarked to her gracious hosts “Shoot them all, I say,” as a flippant scatter gun approach to the possum problem. 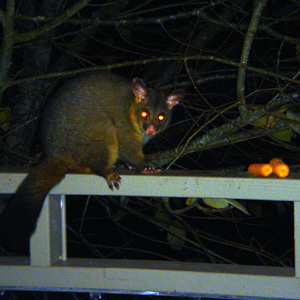 “No, they’re cute” said the hosts (as they refuse to take Ms Possum seriously), and everyone was there to celebrate the auspicious occasion of Mummy possum proudly introducing her new offspring to the kind humans that put out carrots and apples, as a ritualistic offering to them at each nocturnal passing. Ms Possum’s hosts were grateful that Mummy possum had concluded that not all humans shared the same predilections as Ms Possum does for furry attire. Every night at 6 pm Mummy possum would collect her “dinner-to-go” and say a brief hello to the nice humans, while proudly displaying her new possumette in her joey pouch or on her back. Looks like this new “Generation Z” is being trained to progress from being hunter/gatherers to the “How to Win Friends and Influence Humans” approach. Ms Possum waited and waited, camera at the ready, to record this moment in history and to qualify for her Possum PI badge. The inside lounge lights were turned off as an extra precaution. About 7 pm there were a few thumps down to the wooden deck and Mummy and Baby had somehow bypassed the security sensor lights, as these shadowy creatures of the night were barely visible. Ravenous Baby made a dash to collect its belated dinner first. How young ones grow up so fast these days, sigh! And, they don’t want to share with Mum anymore either – disrespectful youth! And where was Daddy possum you may ask? Avoiding his marsupial responsibilities no doubt! Yes, there are distinct behavioural similarities between homo sapiens and trichosaurus vulpeculas – family life just isn’t the same anymore. 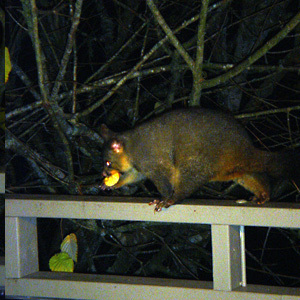 But I digress… as drats, there was no light source for Ms Possum to begin to take a photo. These urban possums are now so technically advanced as to tell the time, to avoid the radar cordon of security lighting, and have tracking devices to know Ms Possum was in the area. Yes, possum spotting is getting decidedly more difficult in our modern age. 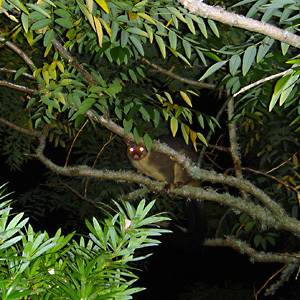 It has been known that Ms Possum goes out nocturnally to enjoy Auckland City by night. But this was a Saturday night with a point of difference. After dining out with friends, Ms Possum was kindly invited back to the friends’ house in the central eastern suburbs, where leaves and trees abound in splendiforous abundance. Because of this our wee furry friends have adapted with cunning ease in this urban sanctuary. Part of my hosts’ family also used to include two huge lop-haired rabbits, who used to feed together outside on the veranda in the company of our furry friends – yep, lapin and possum together in delightful co-existence – if only the races of mankind could do likewise! 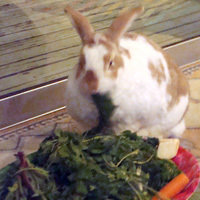 Unfortunately, Mr Bunny predeceased Mrs Bunny (the male always goes first) and now Mrs Bunny prefers to eat her side salad within closed walls due to the present imbalance of power. My host put carrot and apple pieces as per the nightly ritual on the outside verandah rail. We turned off the inside lights and waited. I joked that word had got out Ms Possum had arrived, wearing what no live possum would ever want to see, and that our furry friends would not make an appearance on this particular night. 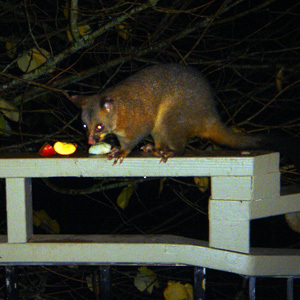 But within only a few minutes, the security lights popped into action with a noisy bounce on the roof, resulting in a crash landing on the deck and a grab at the offerings. More bounces and another furry friend appears. Ms Possum went closer to the window to be stared back at by these courageous critters. They seemed to be carrying out a facial recognition exercise. Either that, or they were mesmerised by Ms Possum’s gleaming dental work as all parties stood transfixed for a few seconds. With everyone “playing possum” who would give in first? No need to ponder, as with a hasty leap off the verandah, they disappeared into the dark void below. The word was out – Ms Possum had come to spoil this clandestine activity and our furry friends were not quite ready to be transported into the fourth dimension. We never saw them again for the rest of the night. Yep, Saturday night possum spotting is a lot of fun! This furry friend wasn’t going to risk Ms Possum getting near him!